From environmentalist Bill McKibben to politician and organic farmer Chellie Pingree, here's what the experts are saying. 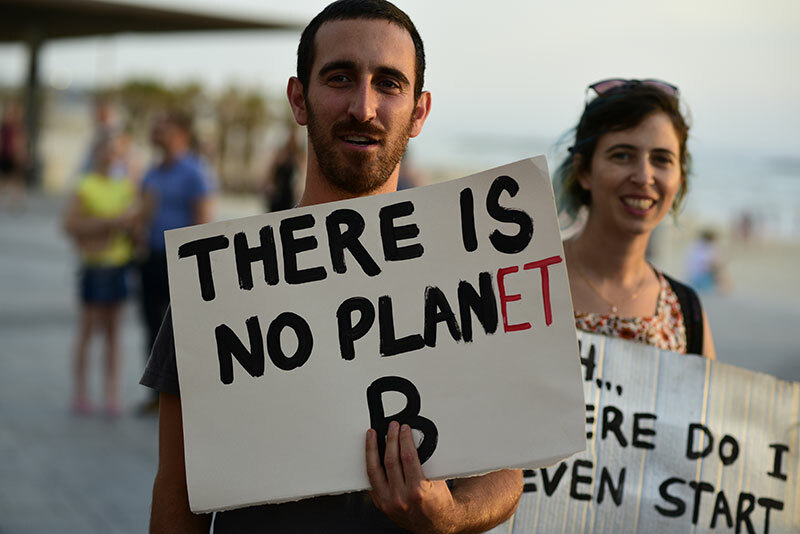 Democrats and Israeli environmental activists protest against Donald Trump In front of the US Embassy in Tel Aviv this past May. There is reason to believe that the food-climate connection may soon get a lot more attention, however. Paul Hawken, the beloved founder of the Smith and Hawken garden tool catalog and best-selling author of The Ecology of Commerce, Natural Capitalism, and Blessed Unrest, has just released a new book on the 100 “most substantive solutions” to global warming – four of the ten most effective solutions, in terms of cost, feasibility, and climate impact, relate to the food system: emphasizing a plant-based diet, reducing food waste, practicing silvopasture (raising trees and livestock together), and not cutting down tropical forests for agriculture. 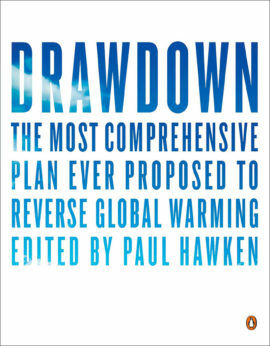 In [amazon_textlink asin=’0143130447′ text=’Drawdown: The Most Comprehensive Plan Ever Proposed to Reverse Global Warming’ template=’ProductLink’ store=’modefarm-20′ marketplace=’US’ link_id=’5d1bfbe8-4d40-11e7-bc4a-ad2a045a94e4′], Hawken reveals that some of the most lauded technological solutions to global warming are less impactful on GHG emissions than relatively mundane agricultural interventions. Offshore wind turbines are number 22, while managed grazing is number 19. Electric vehicles are number 26, while improved rice cultivation is number 24. LED lighting is number 33, while multistrata agroforestry is number 29. The rankings aren’t based on whimsy: Hawkens employed a team of scientists to spend several years analyzing every available option to combat climate change. The full list is available at drawdown.org. Here is what Hawkens, and nine other experts, have to say about climate change, food, and Trump’s decision to pull out of the Paris accord. Four of the ten most effective solutions to global warming, in terms of cost, feasibility, and climate impact, relate to the food system. “As a longtime farmer and a Member of Congress, I found President Trump’s decision to withdraw from the Paris Climate Agreement to be foolish and dangerous, but not surprising. From his embrace of coal to his slashing of energy efficiency, conservation, and research programs that many farmers rely on, this is just the latest example of him turning his back on farmers. On farms across the nation and world, climate change is not a theory; it’s everyday reality. Farmers are dealing with drought, flooding, soil loss, invasive species, pests, and many other consequences of climate change. To help mitigate the effects of climate change in agriculture without jeopardizing food security, we need to incentivize farmers to capture carbon in soil, reduce food waste across the food system, and support research on innovative technologies. Climate change and greenhouse gas emissions are hurting other parts of our food system, too. Here in Maine, climate change has hampered recovery of the once lucrative cod fishery; carbon emissions cause ocean acidification that jeopardizes shellfish populations; and warming waters threaten to drive out the lobsters that are the lifeblood of our coastal economy. “The only thing worse than being in the Paris Agreement is not being in it. The agreement’s compromises – fought for by the U.S. on behalf of its business interests – allowed the world’s leading profiters from pollution to continue to enrich themselves, guaranteeing a world with a greater than 2 degrees Celsius average temperature increase. But for all that, at least the principle that concerted collective action, and redistribution from Global North to South stood for something. Trump gave it the stubby finger. So if you’re worried about climate change, there’s even more reason to militate: any illusion that it would be taken care of by the government can now be buried. If there’s a silver lining, it’s that we can now dream much bigger than the Paris Agreement’s boundaries. If we’re concerned about climate change and justice in the food system, we get to think not just about agroecology, but about redistribution and reparation. Seven of the ten worst paying jobs in the U.S. are in the food system. How about we kick off a commitment to food systems and climate change by raising wages and weatherizing the homes of those who cannot afford to do it themselves?